Blaise Mombourquette and Tony DiGiovanni. Directly following high school, Blaise Mombourquette worked for a custom kitchen cabinet maker, but quickly found he didn’t enjoy the trade; too much time was spent in the shop and warehouse with little natural sunlight. Landscaping is something he has always wanted to do. After resigning from cabinetry, he embarked on a yearlong national mission program in Montreal to work with youth. Mombourquette continues to work with Landscape Ontario member, Yards Unlimited, in Ottawa, Ont., balancing the roles of employee and student at Algonquin College, where he will graduate in spring of 2019 after finishing the Horticulture Industry Program in December 2018. Although he has a wealth of real-world work experience, there are still some things to be learned in class, and yes, at a desk. 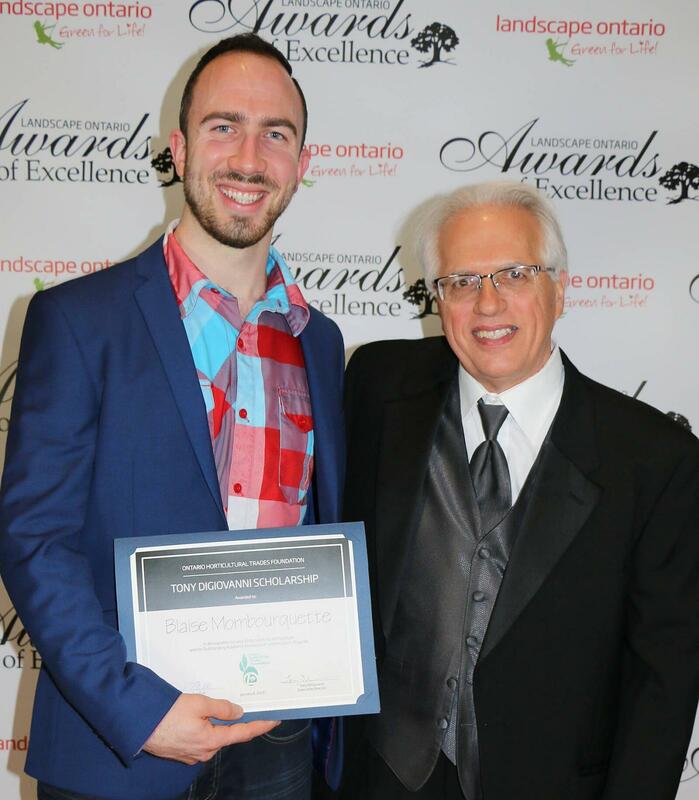 A recipient of the Tony DiGiovanni Scholarship from the Ontario Horticultural Trades Foundation, Blaise is extremely appreciative to both the Foundation and Landscape Ontario (see sidebar). Blaise is keen on continuing his education and has set a goal to get his undergrad in horticulture. Outside of school and work, depending on the season, he enjoys skiing and white water kayaking. “Most importantly I do love to spend time with friends and family,” he says. For more information on available scholarships, or to apply, visit OHTF.ca. I was hoping that you might pass this email on to the Foundation. My name is Blaise Mombourquette. I just have recently finished a horticulture program at Algonquin College. At the start of the program, I made a resolution to myself to give it my all, this included saying yes to all the extracurricular opportunities that came my way. Fast forward a year-and-a-half, and I am humbled, astonished and blessed by the many incredible experiences and growth that I have received. The Ontario Horticultural Trades Foundation has played an integral part in making my education a successful one and an absolute blast! I am deeply grateful for the monetary award that I received for placing first at the Ontario Skills Competition. My journey with Skills this year, winning Ontario and then placing second at the national competition in Edmonton, has given me a great deal of confidence and excitement to press on in my passion for the landscape industry. Doing something I love, building and creating beautiful landscapes, and being recognized for my work inspires me beyond what my words can express. Thank you. I also wanted to express my deep gratitude for being nominated and selected for the Tony DiGiovanni Scholarship. This meant so much to me and really solidified the aforementioned feelings I felt of being recognized for my hard work and success in this incredible industry. As a student and emerging entrepreneur, I am humbled and blessed by the support that the Foundation has given me. Please know that you have given me a great boost in what I know will be an incredible career in this industry. It is my hope and mission to inspire others, whether clients, future employees or just people I come into contact with, to engage with the outdoors and spend more of their lives growing with the world and people around them rather than turning inwards or toward their screens. Thank you again from the bottom of my heart for your support!